Copenhagen based indie 5-piece The New Investors released last May their second album In Love With Everyone. Their music is a perfect blend of electro pop and rock. I had the chance to interview the band a couple of days ago and ask a few questions about their new music video for Deborah, their latest release and other projects. First thank you so much for taking the time to do this interview. I’ve been slightly obsessed with your new album ‘In Love With Everyone’ so it’s so cool getting the chance to talk music with you. How have you been? Thanks a lot. Nice to hear that you are into In Love With Everyone. We’ve been great, thanks. For people who might not have the chance to know about you yet, how would you introduce the band in a few words? We make what you could call neo-psychedelic dream pop. Melancholic in its message and breezily upbeat in its delivery. Who are some of your main influences in music? Beach Boys, Beach House and Prefab Sprout. There’s a song about Paddy McAloon on the album called “So Paddy”. You’ve done some touring before. With what song do you start a gig? We usually open with Suddenly it’s Summer – it very much captures the summer melancholic atmosphere and wistful feelings that we want to put the audience into. This new album is a little bit darker than your previous release “Last One In Is A Dreamer”. What was the starting point of your new LP? Yes, that’s right, our first album was full of breezy summer vibes and as the atmosphere of a sunlit beach. On the new album dusk has definitely descended upon that beach. But the last also did have some melancholic and more gloomy moments like “Enemies Who Once Were Lovers” and “Across the County Line” so I guess the new songs came as a natural continuation of the mood we left the listeners on the last record. Deborah and So Paddy were the first song we wrote for the new album and I guess we were a bit inspired and seduced by the mood of the intro theme soundtrack for the TV series Stranger Things. How was the recording process for the LP? It was more experimental. A lot of the tracks came out a lot different than how we had arranged them before we went into the studio, especially the opening song “Molly”. Also, the ending song “Ikaros” we had thought completely different from what we ended up with. 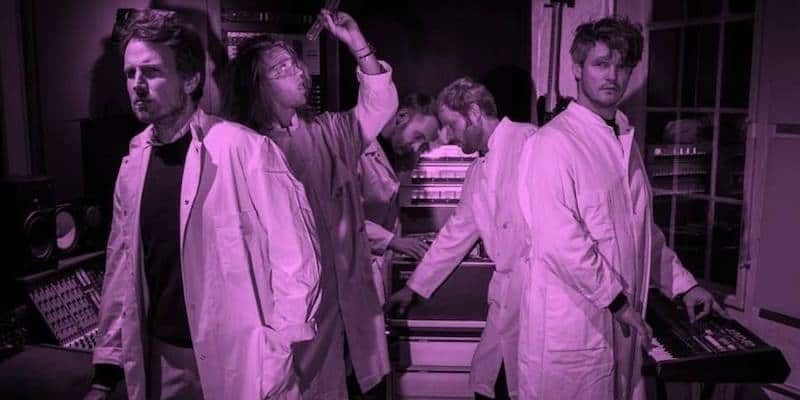 We used the studio more as a sound lab, that’s why we are wearing lab coats on the press photos and this also led the way of developing the idea for the album cover and the whole concept of the album. Is there a song in this album that was particularly hard for you to finish/record? … Yes, “Molly” was a tricky one, we actually had to start over and record it a second time when we found out that it couldn’t be recorded and produced like the way we play it live where it’s much more rock guitar based. The album version has loads of synths and effects on it. You released a couple of weeks ago a video for your song ‘Deborah’. What was the inspiration behind the video? Actually, we didn’t have any idea before starting, I just told the director that the song is about loneliness. One night we just started filming randomly and drove around the city of Copenhagen and saw where it took us. Among other places we went by a Chinese grill bar that had kind of a loneliness atmosphere. Any upcoming projects you’d like to share with us? Right now and for the nearest future we are mainly focused on playing concerts. Who knows, maybe we’re gonna put out a new single or an EP next year, we’ll see. For more music by The New Investors, check out their Bandcamp page and their music on Spotify.